For a change of pace, I'm going to take some time to take a look at some of the best sandwiches I've ever made or purchased. So, with the help of my trusty camera and brain, let's take a look at some creations that have come along. Because who doesn't love a good sandwich? Ah, the sandwich. There's something so wonderfully simple about the sandwich. Anyone can make one out of whatever's at hand as long as they have some sort of bread product handy - that's pretty much the only "rule" that applies. Unless you consider the KFC Double Down a sandwich, and God help you if you do! I think the vast majority of us can consider sandwiches the first thing we ever made; whether it was a sloppily assembled mess of PBJ that you put together to impress your Mom when you were 5, a tentative attempt at grilled cheese at 8, or an ingredient-crammed Peter Fox-style monstrosity to help fuel your rampaging 15-year old hormones. People who 'can't cook' can still make a good sandwich. Now, that being said, there is still a level of sandwich making that goes a little above and beyond, usually based on a combination of ingredients and techniques. I like to experiment with "gourmet sandwiches" once in a while, but I'll admit that the best sammich in existence is the BLT, although I usually forego the L.
It's a fairly standard practice for me, when I have a morning off, to fry up 4-5 strips of bacon, toast some 12-grain bread, slice up a ripe tomato, pile the whole things together and finish it with a healthy dose of President's Choice Garlic Mayo and black pepper. 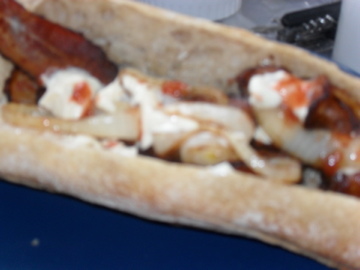 Recently I pushed it a bit further and added onions to the mix. But not just any old onion! I had just finished frying up the bacon and there was all this wonderful bacon grease sitting in the pan waiting for some extra purpose. So, I sliced up some onion into rings and flash-fried them in bacon grease. YEAH! 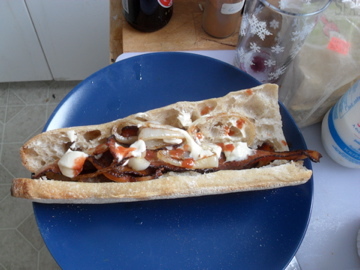 I also happened to have some delicious sourdough baguette from Bread and Sons bakery and topped it off with some of Chamomile Desjardins' Bluenose hot sauce, so it was indeed an epic sammich, as the picture will attest to. Another creation was from an experiment in fish that I tried around the New Year. I've smoked fish, grilled it, baked it and pan-fried it. But there's one type I've never tried and that's gravlax. Now, the recipe (as shown in this recent post) called for 2 pounds, which is a LOT of fish for one person, something I should have considered before undertaking this recipe. In the end, I had to throw some out because I just couldn't eat it all before it went bad. I left some for my girlfriend, but she had a rather squeamish reaction. She's new to fish. Either way, next time I'll use a lot less or make sure I give some away. So that's the first edition of "Not Your Average Sandwich". Any contributions you can provide will be greatly appreciated, especially with photographic depictions. As you may have guessed (or I may have told you), I'm proudly French Canadian. Well, half so, the other half is dairy-farming, Potato-Famine-era Irish immigrant (although my Dad is a judge, my Grampa and all great-uncles grew up on farms and were very typically Irish-Canadian). My Mom did some family tracing and my French roots in Canada are pretty deep. My great-great-grandfather was the mayor of Vaudreuil sometime in the late 19th Century and I've often joked that my Grandpapa's oldest Canadian ancestor is "third from the left of Champlain" is one of those old 17th C. portraits of the explorer (for those of you who have no idea what I'm talking about, look up Samuel de Champlain and get a taste of early Canadian history). Now, that being said, our family, while being of fine quebecois stock, didn't really eat much in the way of traditional quebecer fare. With one notable exception: tourtière (more on that shortly). It might have something to do with the fact that my Mom hated most traditional quebecer food (again, except tourtière) and tended to go with more standard "North American" meals: roast beef, spaghetti, chili, etc. It wasn't until I met my Dad's second wife that I learned a little more about some of the other traditional goodies like 'ragoût de boulettes' (meatball stew) and 'pattes de cochon' (pig's feet stew). Quebec food focuses a lot on making the most out of very little. Expect to find lots of fat, cheap cuts of meat and a crapton of maple syrup! You've already seen one very common quebecois food, cretons, in an earlier post, and we ALL know about the fatty deliciousness of poutine, but there are quite a few foods out there that you might be have encountered in other cuisines that the Quebecois put a special twist on. With that in mind, I'll be running down some of the tastier samplings of quebecois goodness I've had in my life and throwing out a few recipes here and there. So, today's post will cover the first three items: Soupe aux pois, Oreilles de crisse, and Tourtière. Pea soup is one of the most common of traditional quebecois meals, being so commonplace that Quebecers would often be called "Peasoup" in a derogatory manner, somewhere along the same lines of "Frog". Luckily, we have our own comeback against Anglos, who've earned the charming title of "Têtes-carrés", literally translated to "Square Heads". Also, in a funny twist of product development, a company called "Habitant" is well-known for their canned pea soup. "Habitant" is also a common term to reference Quebecers, albeit not actually derogatory. Hence, why you may hear reference to the "Habs" when talking about the Montreal Canadiens hockey teams, Habs being short for Habitants. How's that for some obscure Canadian culture? And you thought we were just a fusion of wannabe Yanks and Brits! Now, traditional quebecois pea soup is a split yellow pea soup cooked with a ham bone or other form of smoked pork. Now, having never actually HAD pea soup, except the odd time out of a can, I didn't realize it was supposed to be yellow. Oops... Instead, in a fit of longing for comfort food, I got my brain circling around the idea of making a pea soup, but using something a little more gourmet than ham. The thought hit me like a bolt - Hey, Pancetta! Pancetta's good and I'd never used it before. So with a vague concept in mind, I now needed a recipe! Luckily, Google provides. What I found was a made-up recipe from this nice lady out of Oregon who writes a food blog entitled "Bread & Honey". I've made a few tweaks with the herbs and added an extra touch using frozen peas. - In a very large pot, fry pancetta on medium high heat with a splash of olive oil until crispy and browned. - Remove from heat and spoon out all the pancetta onto a plate, leaving the fat in the pan. - Place pot back on heat and sauté veggies until onions are glassy and begin to soften. - Reduce heat to medium. Add broth and stir. - Add potatoes, then split peas and bring to a boil. - Turn heat down, add seasoning, and simmer on medium-low (3-4) for about an hour, or until peas become soft and soup thickens. - Sprinkle with crunchy pancetta before serving. The above image is purely an approximation, albeit fairly accurate, of how it'll turn out. I like to throw in a few shots of hot sauce and eat with LOTS of warm bread and butter. So there's my take on Soupe aux pois. It's very hearty and thick and easily serves as a meal on its own. These are standard fare at the multitude of cabanes à sucre (sugar shacks, where maple syrup is made in the Spring) in the province. They're essentially smoked pork rinds, fried in lard and bathed in syrup. They mostly taste like bacon, but crispier. With that in mind, I'm going to plug the cabane à sucre where I first tried oreilles de crisse. Sucrerie de la montagne makes for a a lovely family or foodie outing where you'll be stuffed to the gills with traditional quebecer fare, listen to some old-time Quebecois music, and be served by pretty French Canadian girls (and trust me, French Canadian girls ARE hotter, it's a fact. I'm totally not biased by the fact that I'm dating one). It's just outside Rigaud, Quebec, about 90 minutes from Ottawa by car, 45 from Montreal. In case you're wondering what "sucrerie" means, it's also a word for sugar shack. Yes, Quebecers love their maple syrup so much that they have two words for the place where it's made! Christmas amongst French Canadian Catholics (which is almost redundant) entails a tradition known as Réveillon. The Réveillon is essentially a massive feast that occurs after celebrating Midnight Mass (which happens around midnight of December 25th, but usually begins before). Réveillon is a tradition in most French Catholic cultures, including Cajuns in Lousiana, but in Fench Canadian culture, one of the main dishes is tourtière. It certainly was when I was a kid! The turkey dinner would happen the following evening. So what is tourtière? Basically, it's a meat pie. But, depending on which part of Quebec you're from, the details vary. For example, if you're from the Saguenay region, a tourtière is more like a cipâte (see below). But around our house, tourtière was a mix of ground beef, veal and pork with a bunch of seasonings served with either store-bought ketchup or some kind of wonderful home made version (aka ketchup maison, or similar preserves such as green tomato relish or chow-chow). I also find a medium or hot salsa is a great condiment to tourtière. What I'm posting here is my Mom's recipe, I've never tried making it myself (the thought of trying to make the pie crust intimidates me), but Lord knows I've eaten my share! It's nothing too fancy, but its tasty simplicity is a good analogy for Quebecois cooking in general. This recipe has handed down over many generations, with tweaks coming from every cook that makes it. There is no real "standard" tourtière recipe. - Divide the butter or margarine and Crisco in half and cut each half into quarters. - Place the quarters [that’s 1/2 cup of each] in the bowl of a food processor. - Add 2 heaping cups of the flour. Process until the fat and flour are well blended and are the consistency of coarse meal. - Transfer mixture to a large bowl and repeat process for the rest or the fat and flour. If mixture seems too wet, add flour a bit at a time. - Make a well in the middle of the fat/flour mixture. - Pour in the ice water and quickly mix with a fork to blend. Work mixture as little as possible. The more you work it, the tougher the crust will be. - Gather up the mixture and form into a ball. Wrap ball in plastic or waxed paper and refrigerate for 1 hour. Divide dough into quarters. If making a double crust pie, one “quarter” should be slightly larger than the other. - On a floured surface, roll out dough to desired size. Again, work as little as possible. Transfer dough to pie plates and fill as desired. - When making a baked pie shell, place dough on an inverted pie plate making sure that dough extends a bit over the edge of the plate. Cut off the extending edges with a sharp knife, wet your thumb and gently crimp edges of dough to seal to edge of plate. Pierce the top and sides of dough several times with the tines of a fork. Bake in a pre-heated 400 degree oven for 12 mins. Lower heat to 350 and continue baking for 15-20 mins or until golden. Cool on a rack for 15 mins. Gently loosen edges of crust with a knife then invert crust into another pie plate and finish cooling on a rack. - Do not use food processor to add liquid. Dough will be “overworked” and turn out tough. - You can always halve the recipe or freeze any dough you don’t use. - In a large frypan, fry pork, garlic and onions. - Add spices and enough water to cover meat mixture. - Bring to a boil, reduce heat and simmer, stirring frequently, for 1 hour. - Drain fat and place mixture in a food processor or meat grinder to mince. - Roll out bottom layer of pie crust. Place in pie pan. - Place meat mixture on top of crust. - Roll out top layer of crust and place on top of meat mixture. - Seal edges of crust. - Bake in 400 degree oven for 12 mins. Reduce heat to 350 degrees and continue baking until pie is done [about 30 mins]. - If freezing pie, reduce baking time to 15 mins. Cool pie, wrap in foil and freeze. This is basically your standard tourtière presentation (with ketchup maison on the side). Slice yourself up a big ol' piece while it's still warm and enjoy! To note: it can also be served cold (but it's better warm). On retourne aussitôt que possible avec plusieurs d'autres recettes et histoires des mets québecois! I'm back again with more of my impressions of some of the finer places to eat in Ottawa. Well, today's post is a bit special in that I'm retelling one of the better dining experiences I've ever had in my life. 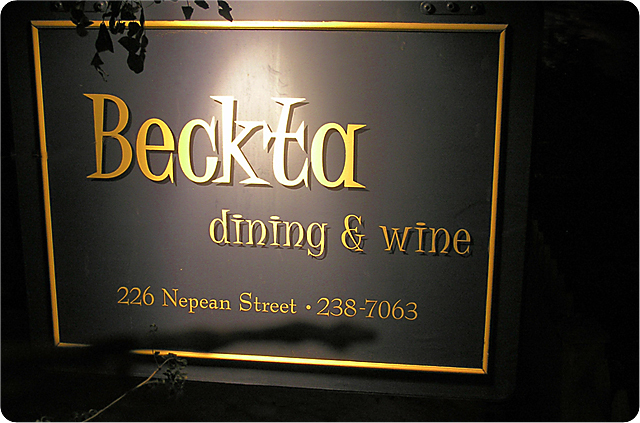 Kari's (my girlfriend/fellow unicorn hunter) birthday was March 15, so the preceding Saturday night we celebrated by going to what is generally considered Ottawa's finest restaurant, Beckta. We decided to go full out and have the 5-course tasting menu with cheese plate and wine pairings. Add a few cocktails and tip and the whole thing clocked in at 400 bucks. Good thing I have disposable income this month! But, totally, absolutely and utterly worth every penny. The difference between Beckta and every other restaurant I've been to is in the service. No one server takes care of you, although there's a 'mostly' dedicated server. Instead, each server takes care of you as needed or as available. Special props to Alex, the 'bread guy' who delighted us with three different kinds of bread, but especially made our night by describing the process of caramelizing butter (which was served with the bread, and was good on everything!) and to Bill who was our dedicated server and made my night by being able to describe our meals and wine pairings without coming off too condescending or pretentious (something that I was glad to see didn't happen too often, because I was expecting it a little, although the sommelier's forced guffaws at my jokes were a little grating). Now, the food itself was inspired with nearly zero slips or disappointments in a 5-course meal (6 if you count the cheese plate). It was a true culinary wonderland of surprises as we had no idea what our courses would be until they were in front of us. Something I really appreciate since, as you may remember from my last post (http://dudecook.blogspot.com/2011/02/if-i-were-chef.html), I too would like to "surprise" my clientele (if I had a business that had such things) with unannounced menu items. And as an added bonus, they wrote up the whole menu and gave us a print-out after we were done. YAY! The flavours of the tuna and the cocktail mixed beautifully, with elements of earthy, tangy and fishy (in a good way) all intermingling on the taste buds. It was kind of like there were go-go dancers on my tongue. So, a wonderful mix of flavours in this one, with the blinis being little pockets of potato-flavoured air and the honey being like none I've ever tasted. If I have one issue with this dish, it's that the flavouring of the trout was a bit too subtle when paired with the bold salty-sweetness of the candied bacon. If I were doing it (and consider this the gauntlet lain to anyone who reads this), I'd have hot-smoked my trout (or, what I would preferably use, Arctic char) to give it a stronger, woodier flavour. Now, that being said, I'm simply a fairly talented amateur, so what do I know? The wine was a great compliment here, having a subtle fruity taste and strong mineral tang in the finish. It pepped up the flavours of the dish tremendously without losing its own character. Wow. This dish introduced me to something that is going to haunt me till the day I die: Lamb Pancetta. Lamb... freakin'... Pancetta!!! SOOOOOOOOOOOOOOOOOO GOOOOOOOOOOOOOOOOOD!!! Imagine bacon, but with lamb's delicious subtle gaminess. Yeah, I need to figure out that one and make my own. As God as my witness, I will never go without Lamb Pancetta again! OK, OK, there was also all the other bits of deliciousness that I need to describe. Well, let's make it simple: the muffin was tasty, especially the texture. The egg yolk was, well, egg yolk fried in tempura. Since I'm not a huge egg fan, I can't give it its proper due. BUT, in a nice surprise, Bill told us that the yolk would be runny and get all over everything (which made me cringe as I hate runny yolk). Lo and behold, a nice solid yolk. As for the hollandaise, well, hollandaise is another one of those culinary items that does not really send me to the moon. It's damn tasty, but just not one of my faves. But the addition of the Meyer lemon really made it dance. Definitely one of the best I've ever had. With this dish, I'm going to make clear culinary ignorance and declare that I have no freaking clue what 'Njuda pâté nor Micro Osaka mean. Internet to the rescue! Nduja pâté: Oooooooh, it's like a pork pâté made from the head! THAT's what that extra meaty subtleness was! In the end, this course could have been Lamb Pancetta on a soda cracker and I would have been impressed! OM! As for the wine pairing, I was completely taken aback at the flavour of the sparkling wine. Normally, I'm not a huge fan of sparkling wine. I find it needs to be mixed with something. But the elements of this wine on the tongue were complex and remarkable. The flavour that came out the strongest, and this might sound crazy, was turmeric. Yeah, earthy, dense turmeric in a sparkling wine. Weird, eh? So, on top of that, there was the Boudin Noir, which is essentially blood sausage. I'd never had it before, but I found the flavour quite reminiscent of haggis. Good thing I love haggis! The Ghost Pumpkin Puree (ghost pumpkin and white pumpkin are the same thing) was subtly flavoured, imagine a less strong tasting squash. Didn't really taste like pumpkin, but that isn't a bad thing! I loved the Grilled Cortland Apple element. There's something magical yet totally simple about grilled apple. The whole came together as a kind of autumnal comfort dish, and paired tremendously with the New Zealand Pinot Noir. Being especially fond of Pinot Noir, I was very pleased to try one from a region I didn't even know grew Pinot Noir grapes! As a good Pinot should be, it was light and flavourful. So, needless to say I was almost jumping out of my seat when this gorgeous piece of burgundy, almost dark purple, meat got to the plate, surrounded by deep, rich red and orange, which were in turn offset by the lighter greens and whites of the bok choy and taro root. It was a beautiful plate (and this coming from the guy who doesn't really give a flying fig about food presentation). What was even more beautiful was how tender the bison. I could damn near cut through the 2 inch thick striploin cut with my fork. But I stopped myself for fear of making a racket and a mess. I do, on occasion, stop my clumsiness from going too far... The meat was delicious, lean, and surprisingly un-gamey. It tasted like beef that had infused with, I don't know, faerie dust? It's hard to describe the first time you taste something! The Taro Root Robuchon was basically a mash (apparently "Robuchon" refers to a method of cooking based on the name of a French chef. Here's the loop, and then here's me, about 5 light years away) with a nutty, subtle parsnip flavour. Very nice. The "Tame" Mushrooms simply meant that the mushrooms weren't wild. Um, OK... They were mushrooms, so what can I say other than mushrooms are awesome? These were as well! Can't really say much about the wine. It was a big, bold California Cab, ideal for red meat. It was definitely playing Robin to the bison's Batman. In other cases, like the Eggs Benedict, the wine almost overshadowed the plate. Totally not the case here, which is good. I can't imagine having a wine so bold as to overpower a bison steak would be a wise idea. Around this point, Kari had already been gripping the table in joy, but she was starting to feel a bit full. She wasn't sure about going for the cheese plate. So, we decided after they cleared our table of the bison plate, to just chill and finish our wine. And then those sneaky bastards took the cheese for a walk to another table, right in plain sight! When Kari saw those pretty veins of blue cheese, she didn't need any further convincing. So, this was a veritable "world tour" of cheese, with some from France, Ireland and here at home (OK, so more like a Euro-Canadian tour). The Prestiche de Bourgogne was one of the creamiest Brie/Camembert-style cheeses I've ever had. It was almost buttery, and richly flavoured without being overpowering the way, say, a Boursin can be. Thoroughly enjoyable. Next was the Niagara Gold, a cheese with a cheddar-like texture which got met with mixed reactions. It had a very strong "barn" smell and flavour. Kari thought it was icky, I found it intriguing. But not really delicious. Definitely last on the list. The Sainte Maure de Touraine was a goat's milk cheese out of Quebec with a remarkably subtle flavour. Kind of a welcome change from the standard over-the-top sharpness of most "chèvre". The Smokin' Back Forty was a Beckta exclusive (oooooh, fancy! ), made in nearby Lanark County, then shipped to the resto where they smoke it with rosemary. Yeah, guess which cheese was my favourite? This had a wonderful light smoky flavour (they used apple wood, I think) that didn't overpower the natural fresh flavour of the cheese itself. I need more! Maybe Beckta will cut me a side deal? Would ya? Guys? Pleeeeeeeease?! I'll totally be your friend forever and ever! The Peau Rouge comes out of Quebec (I think) and had a strong sharp flavour that is nestled somewhere between an extra-old cheddar and a Parmesan. Very salty, but in this case the saltiness worked well, especially when cut by the Madeira. And the cheese itself did this fun little dissolving act on the tongue that was quite enjoyable. Last but not least was the Celtic Blue (from Ireland, I assume?). This was a very mild blue cheese, which was rather welcome at the end of the night. My taste buds were getting a little overwhelmed! Not really much to comment about it. It's blue cheese, it's delicious! The Madeira pairing served as kind of a catch-all to cover the sheer variety of all these cheeses. It worked well, having an almost maply flavour and richness, but without so much sugar. It had a velvety finish that gave an exquisite mouth feel when matched with the creamier cheeses. So, the desserts were a series of little squares (hence "Cubist" - Oh you witty chefs!) served with the usual artistic flair that I have yet to master. First, the Grilled Pineapple Polenta Cake. The flavour was reminiscent of pineapple upside-down cake, albeit better (naturally). What made this dish unique was the interesting exercise in texture it presented. On its own, when first biting a piece of the cake, it was tough and chewy, but as you chewed it with the pineapple, the acidity of the fruit helped to soften the cake into a perfect bite. It was like a chemistry class in my mouth! Next was the White Chocolate Bavarois (aka Bavarian cream). This one was sort of neutral to me in the sense that the flavours didn't smack me upside the head and scream "I'M NEW! LOVE ME!" It was creamy white chocolate goodness. Not much else I can say about it. What's a Semi Freddo? Half of a wimpy Corleone? The Italian name for a pair of ambiguously gay hobbits? In fact, it's an Italian term for a "half frozen" dessert. Basically, a frozen kind of mousse. Not sure how "freddo" this Cinnamon Date Semi Freddo was, but man was it molto bene! I'm a big fan of cinnamon when used correctly, and it was here, blending superbly with the mousse. The flavour of date (which must have been ground in this case) played more of a support role, which I enjoyed. Too much date is cloying. Not what I needed from dessert, especially since the Riesling had a honey-like palette. Both together would have been way too much. But the pièce de résistance (and likely the easiest to prepare) was the Citrus-Cured Papaya. So fresh and tasty and bursting with goodness, it was exactly the way to relieve the tongue of all those flavours. The Esplenette Pepper was this lovely melange of spicy and sweet (peppers and sugar) and the whole of it came together in a perfect end note to the evening. The Reisling was a surprisingly good match, especially considering how much I normally dislike sweeter wines. But in this case, it complimented with the Semi Freddo and Bavarois and was deliciously subdued by the acidity of the pineapple and papaya. So, friends, there's my tale of culinary extravagance told. Finishing touches came from Bill as he brought us the print-out of our menus as a souvenir, and Alex suggesting that if I needed the recipe for Lamb Pancetta, to maybe ask for it on the Beckta Web site (http://www.beckta.com/). In the end, this was an unforgettable experience, one I hope to recreate when my pockets are once again obese. To the servers and cooks at Beckta, I salute you for being the artists that make life so much better for Hedonists like me. Maybe some day I'll repay the favour! And to anyone watching who's in the know or happens to work at (or own) Beckta, I hope you like what I have to say. I welcome any clarifications about the meal and suggestions for future dining experiences. Sometimes you can come up with things in the kitchen that make you laugh with an "M" at your own evil creative genius... MWAHAHAAHHAHAHAHAHAHAHAHAHAAHHAAAAAAAA!!!!!! But sometimes it can work to mix unlikely ingredients into interesting pieces of culinary fusion. It also helps you clear out the fridge and freezer! Just recently I found myself unsure of what to make for dinner. So, head to the supermarket, right? Well, the local supermarket was closed, leaving me to have to go to the nearby organic veggie market, which is somewhat more expensive. But, red cabbage was fairly cheap, and their avocados were about the same price as the supermarket, and nice and ripe! So, with unconventional fusional recipes inventing themselves in my mind, I bought the produce and went home to see what I could bash together. What I came up with was something I've named Mad Scientist Stew. It's basically a fusion of flavours from Eastern and Northern Europe, basically a Slav-Scandinavian fusion, with a touch of Mexico (the avocado) and East Asia (ginger). I made it pretty spicy too. The reason I thought this might work is that sour cream is part of European cooking as well as Mexican, and that the buttery texture of avocado would be an interesting counterpoint to the sweet/sour flavouring of the stew. The amounts I used were determined on the spot, so bear with me. I found this was really good with a cold beer, but I bet a nice dry white wine would work well too. Yes, I realize there's red wine in the recipe, but there's also white fish, so I figure white wine. This next recipe is more 'goat' than 'mad scientist'. I had a few ingredients in the fridge one night that I knew needed to be used up soon or they'd go bad, but I didn't really have a clear recipe in mind. I'd recently made some sort of Thai curry and had a bunch of leftovers as well as lots of veggies. So, feeling bold, I decided to try and a wacky mix of Mediterranean and Thai flavours together. The result was surprisingly good. I'd give it a 3 out of 4. So, if you want to try a semi-traditional pasta sauce with Thai and Ethiopian elements, here you go! - Sauté garlic and onions in olive oil for about 4 minutes, ensuring the garlic doesn't overcook. - Add tomatoes, beef or chicken (if using) and cook for another 6-7 minutes. - Add tomato paste, curry paste, Berbere spice and pepper. Stir until pastes are well dissolved into sauce. - Add peppers and simmer at medium-low for about 10 minutes until peppers are somewhat cooked. I was surprised at the interesting mix of flavours. Definitely not for the faint of palette! So, there you go! Sometimes it's more fun to say "Frak the rules" and go a little crazy in the kitchen. You never know what the result might be! Just remember this: the Caesar Salad was invented as a "mad scientist" kind of recipe. And who doesn't like Caesar Salad? Cheers! Enjoy! Feast! Create! Experiment!